The FBI is to investigate the role of the private security firm, Blackwater USA, in the fatal shooting of 11 Iraqi civilians in Baghdad last month. An FBI spokesman said criminal charges were possible if its inquiry agreed with the Iraqi government's findings. Iraq has accused Blackwater's employees of opening fire on civilians without provocation, a charge the firm denies. 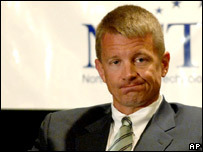 Later on Tuesday, Blackwater's chairman will appear before a Congressional committee investigating the incident. Erik Prince has insisted his firm's personnel acted in self-defence after insurgents attacked the US diplomatic convoy they were protecting. "We look forward to setting the record straight on this issue and others tomorrow when [he] testifies before the committee," his spokeswoman, Anne Tyrrell, said on Monday. The FBI's investigation is the fourth into the shooting at al-Nisoor square in the Iraqi capital on 16 September and was begun at the request of the US state department. Special Agent Richard Kolko said the FBI would send a team to Iraq to examine the possibility of bringing criminal charges in light of the allegations that Blackwater guards shot innocent Iraqi civilians. The Iraqi Prime Minister, Nouri Maliki, has described the shooting as a "criminal act" and an inquiry by the Iraqi interior ministry has concluded the security guards were "100% guilty". Private Security Contractors (PSCs) are currently granted immunity from prosecution under Iraqi law by Order 17 of the now defunct Coalition Provisional Authority, although they are technically subject to the law of their "sending state". The BBC's Justin Webb in Washington says that after years of profitable business in the shadows of the Iraq insurgency, the private security industry is suddenly in the spotlight and in trouble. The Congressional committee which is preparing to ask tough questions of Erik Prince, Blackwater's chairman, later on Tuesday has produced a report on the eve of the hearing that suggests he may well be on the defensive, our correspondent says. The report prepared by the staff of the committee's chairman, Henry Waxman, released details from Blackwater's own accounts of several incidents involving Iraqi casualties, in which it said its employees had fired first on 163 out of 195 occasions. In the majority of cases, the guards fired their weapons from moving vehicles without stopping to count the dead or assist the wounded, the report said. It also said state department officials had recommended compensation payments to victims' family members in at least two cases. US diplomats also helped a Blackwater employee leave Iraq less than 36 hours after he killed a bodyguard of one of Iraq's vice-presidents while drunk. He faced no criminal charges. "There is no evidence in the documents that the committee has reviewed that the state department sought to restrain Blackwater's actions, raised concerns about the number of shooting episodes involving Blackwater or the company's high rate of shooting first, or detained Blackwater contractors for investigation," the report said. "It appears that the state department's primary response was to ask Blackwater to make monetary payments to put the 'matter behind us' rather than to insist upon accountability or to investigate Blackwater personnel for potential criminal liability." 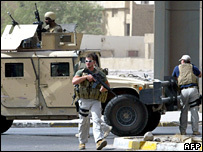 Blackwater has earned more than $1bn (£490m) from US government contracts since 2001. The state department paid the company more than $832m (£408m) for security work between 2004 and 2006.